One of my least favourite literary tropes is the whole idea of “instant love.” You know how it goes, hero and heroine see each other for the first time and there’s a mysterious yet undeniable pull drawing them together. There’s no point fighting it, they were made each other, when they touch sparks fly, and blah blah barf. And while I’ll agree that when it comes to books what people like and don’t like is highly subjective, I don’t think my dislike of literary soul mates is all on me. Because let’s be honest here, more often than not, the whole thing is handled pretty poorly. Because it’s lazy. The author doesn’t want to go to the effort of actually showing the characters falling in love, so they just make it fate or destiny or some rubbish. It's a cheap shortcut. I don’t deny that two people can experience an immediate attraction for one another, but there’s a big difference between that and instantly professing undying love. But that’s the funny thing about books isn’t it. Something can be done poorly 99.9% of the time, but that doesn’t mean that, in the hands of a skilled writer, it can’t be done well. 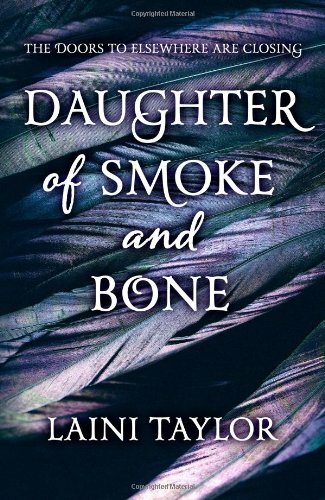 Enter Daughter of Smoke and Bone. A book that seemed to have been tailor made to display everything I dislike in a book. 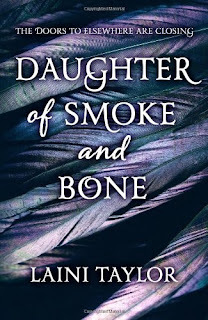 Split between Earth and another world (I prefer my books to pick a dimension and commit), featuring a quirky female protagonist (with blue hair, if you don’t mind) and, of course, the insta-love. But while I disregarded it at first, when every single review blog that I followed started to post glowing reviews, I decided I had better give the book a chance. And wow. I’m definitely glad I did, because this is one beautiful book. And it’s not that as though Taylor’s take on things is groundbreakingly new and original. If any other author had taken the exact same plot and written it out scene for scene in their own style, I doubt I would have like it. Because it’s the style that raises this book from ‘eh, ok,’ to freaking amazing. Taylor’s prose is just incredible. She writes with a deceptively simple elegance that was a joy to read. And I know that sounds like one of those things that people just say, but I mean it literally. I don’t think I’ve ever encountered an author who could create such fantastic and vivid scenery in my head. And she would to it with only a couple of beautifully wrought sentences. I mean, here I am stumbling clumsily around trying to convey how effortless and stunning Taylor’s prose is, whereas she could probably get the same point across twice as well in seven words. Even the endless descriptions of how beautiful the two main characters were didn’t bug me as much as it normally would have, and trust me, there is a lot of reflecting on the beauty of the two leads. But it’s balanced out by a creepy and inventive magic system where all gains come with real consequences, side characters with actual depth and a real world setting (Prague) that seems as magical as any fantastic location I’ve ever read about. I can’t but think that if this is what Taylor does with a slightly above average paranormal romance plot, imagine what she could do with a genre I actually like! I know that from this point on I shall be following Taylor’s career with great interest.